LanguageTool does not support stripping TeX formatting markup (in contradistinction to ispell/aspell/hunspell) just because doing it properly would require writing a full-blown parser for TeX (whose markup is Turing-complete, hence hard to parse). But there are options you can use. As you can see, there are still some quirks (\cite is incorrectly treated in the example above) but it's still much easier to use than other options. You can actually correct the .tex source directly using LanguageTool, by using OmegaT, a computer-assisted translation (CAT) tool. Basically, what I will describe below is a simple setup that creates an artificial "translation" of your .tex file: actually, the corrected .tex file in this case will be the target translation. Note: OmegaT does include spell-checking, you simply need to install the dictionaries. Get OmegaT and install it locally. Note down the location of the install. 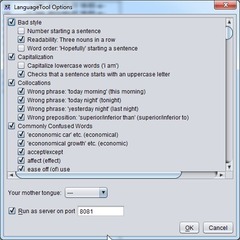 Get OmegaT LanguageTool plugin. 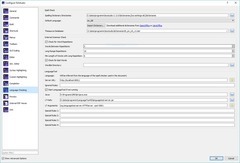 Install the plugin into the plugin directory of the OmegaT installation on your computer. The script takes the .tex file as its argument, and creates a pseudotranslation project for OmegaT. Then it opens it for grammar checking. If you are using a Unix-like operating system, you need to create a shell script but it should be pretty straightforward. Feel free to send the file to me if you changed my script this way. Replace "PL-PL" with a language of your document, for example, "EN_US". OmegaT does not include a fool-proof parser of TeX but it does a pretty good job. Anyway, if you see any problems with its treatment of your .tex files, simply go to OmegaT support and file an issue. You can convert your (La)TeX source to html using Tex4ht and check the html file. LanguageTool strips all HTML or XML markup if you specify --xmlfilter (although this option has its bugs), so it should be an easy solution. 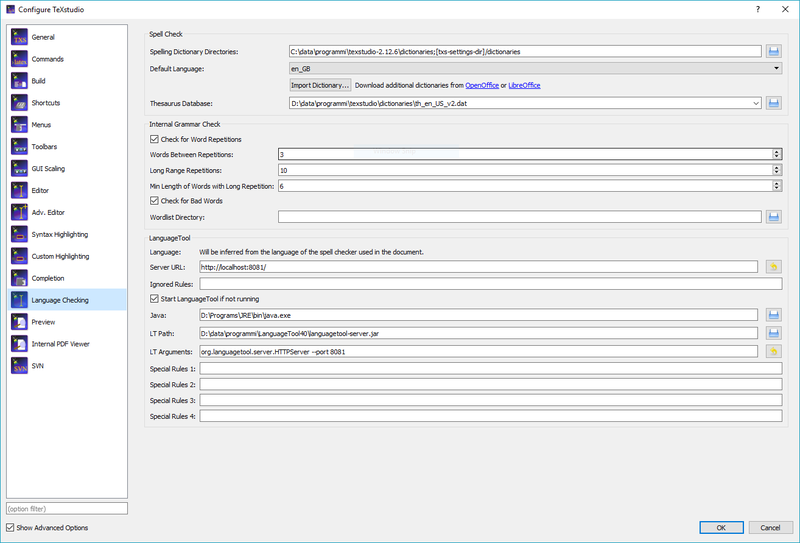 You may also convert .tex files to OpenDocument and then use our extension for LibreOffice: this allows to check both on-the-fly and using a dialog box (if you don't like our simple GUI). Some people use detex to convert TeX files to pure text but your mileage may vary: detex may work incorrectly for many kinds of input. However, opendetex seems to do the job quite satisfactorily. Again, you cannot edit the .tex source directly. 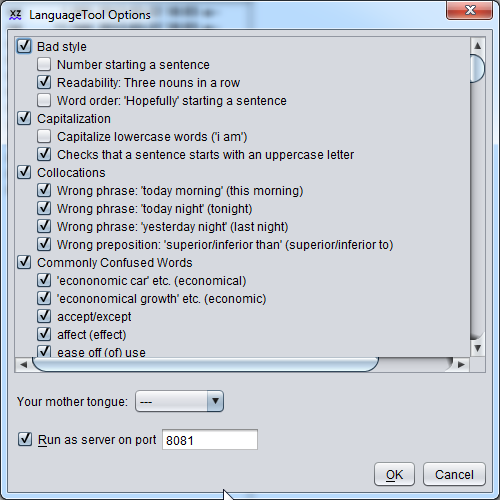 If your document is in English and your document class fairly simple, you might try to convert your document to lyx, and then try the LanguageTool plugin for LyX. Note however that the plugin does not support other languages than English. It doesn't seem to work under Windows either. Also, the conversion from .tex to .lyx is particularly tricky if you are using non-windows encoding under Windows, and will not work for really complex documents. The plugin definitely needs some refreshing as well.